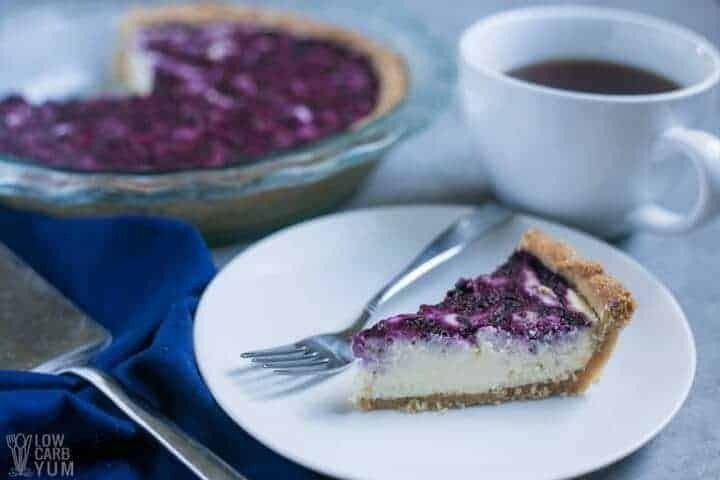 This pretty low carb blueberry swirl cheesecake is quick and easy to prepare. 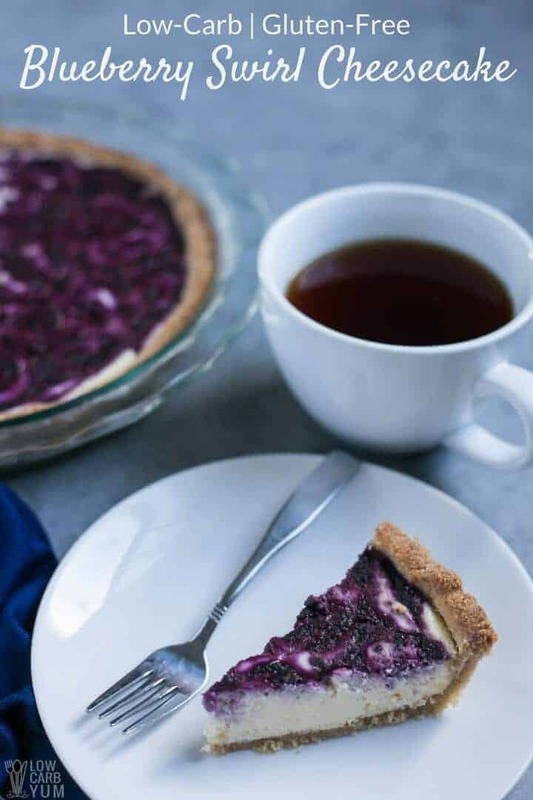 It uses a simple blueberry puree and a gluten free almond flour based crust. 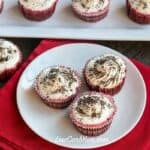 Holiday baking season is upon us so I thought it fitting to bake up a new cheesecake recipe. 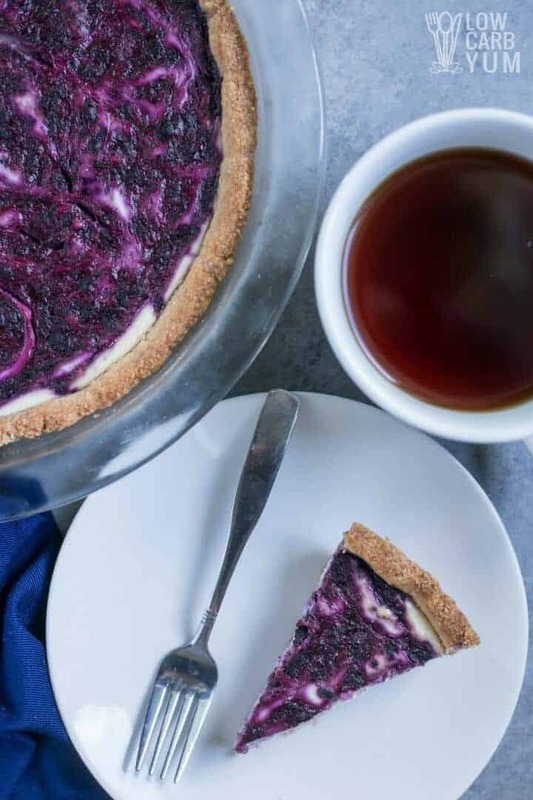 This is a simple recipe for blueberry swirl cheesecake with a gluten free almond flour crust that bakes up in a pie pan. 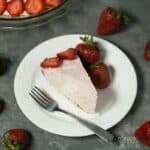 The filling part of the recipe could easily be doubled to fit into a standard 10″ springform pan for a more traditional cheesecake. I would keep the crust ingredients the same if using a springform as the crust wouldn’t be pressed along the sides. 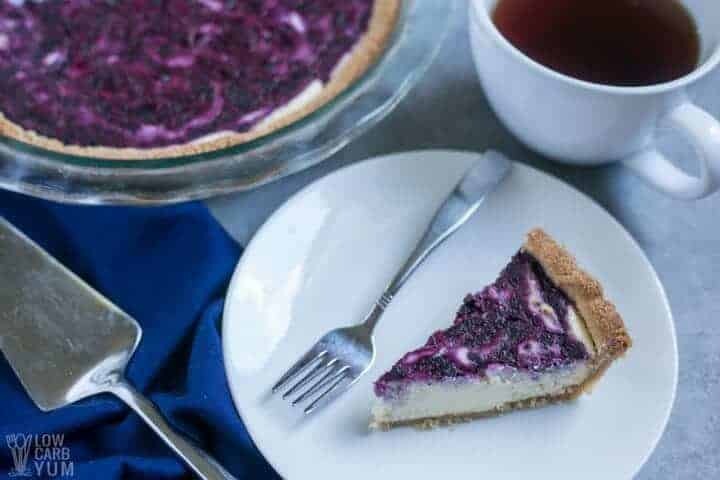 This low carb blueberry swirl cheesecake can be made with either frozen or fresh blueberries. 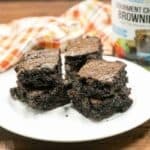 It could also be made using a pre-made sugar-free blueberry syrup or sauce like the recipe I have here. 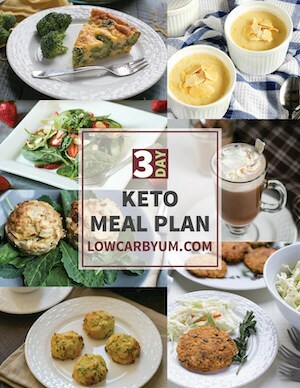 I am still feverishly working behind the scenes cleaning up the design of this blog website. There are so many things I want to do, but so little time. There will be many subtle changes coming in the months to come on the blog. A lot of the changes I’m making to the blog are aimed at making it easier for readers to navigate through the site and find the things they are searching for. 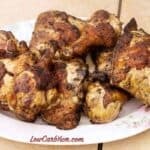 Unfortunately, because I have been spending a lot of time on the website design, I haven’t had as much time as I’d like for posting new recipes. I’ll be taking some time off work for the holidays so perhaps that will give me the time needed to do both. With this blueberry swirl cheesecake, I tried a new crust recipe. 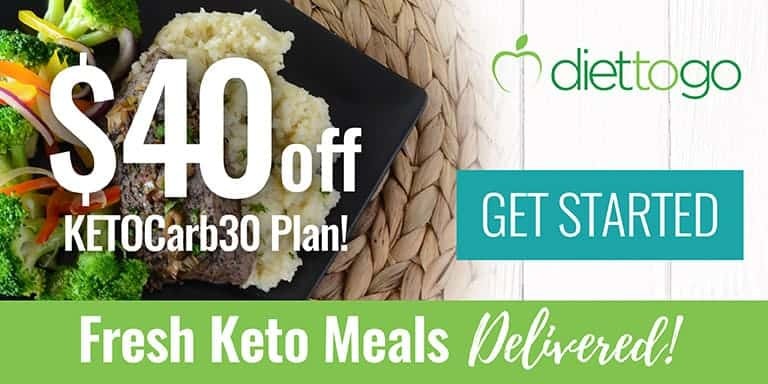 Most of my previous low carb cheesecakes have been made with a pecan based crust like the one I used in my cranberry swirl cheesecake recipe. 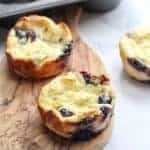 Since I used pureed frozen blueberries in this recipe with no added liquid, the fruit was a bit difficult to swirl into the cheese filling. Perhaps I should have let the blueberries thaw a bit or add a bit of water to make the fruit puree thinner. Although the blueberry puree was thicker than I would have liked, I still managed to get decent swirls from them. This is how the blueberry swirls looked like before baking. Here’s the result after baking. I ended up baking the cheesecake the full 40 minutes so it is a bit brown. I probably could have taken it out a bit earlier just before the center was set. Although there is definitely some room for improvements, I was pretty happy with how this low carb and gluten free blueberry swirl cheesecake turned out. Any improvements to the recipe would be for looks as this was one very yummy cheesecake. 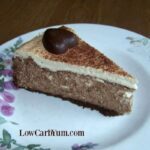 I used this recipe as a base for making my low carb pumpkin cheesecake pie recipe. 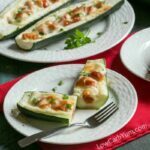 That one is super creamy as well so if your a pumpkin lover, you should definitely give it a try. 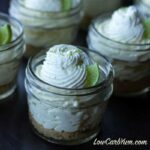 And, if you aren’t into baked cheesecakes, take a look at the collection of no-bake sugar-free cheesecake recipes that I put together for community table. 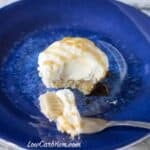 Cheesecake is such a delicious low carb dessert! 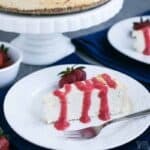 This pretty low carb fruit swirl cheesecake is quick and easy to prepare. 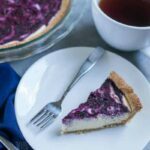 It uses a simple blueberry puree and a gluten free almond flour based crust. With a fork, mix together almond flour, cinnamon, and sweetener. In large mixing bowl, beat cream cheese, sweetener and vanilla until blended. 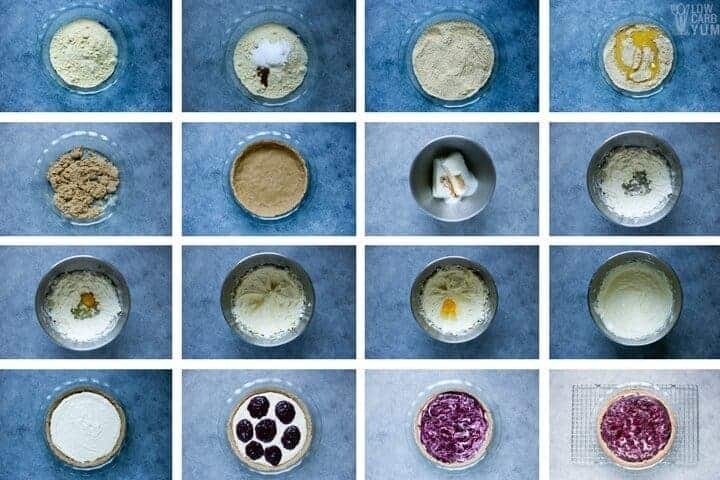 Puree blueberries in blender or food processor. Drop several spoonfuls of pureed blueberries gently over filling, swirl in with a knife. Bake at 350 ºF for about 35-40 minutes or until center is almost set.